The man named Gideon was born in Spain sometime in the second half of the 15th century. In the year 1492, he was a deckhand aboard the Pinta, one of the three ships with which Columbus sailed across the Atlantic Sea to eventually discover the Americas. A rather common disease of sailors back in the day was scurvy, caused by lack of vitamin C, as there was no way to store fresh citrus fruits over the week-long travels. Gideon too succumbed to the disease, his teeth loosening and his gums swelling and bleeding. More dead than alive, he was dumped into the ship’s hold alongside other sick sailors. Sometime during that night, Gideon died… but he woke up the next day nonetheless. At the dawn of the 21st century, Gideon had established himself as an eccentric businessman and CEO of Ophrah Industries in Denver, Colorado. He took quite an interest in other multimillion dollar companies such as DaCosta International, Shaw Industries, Roxxon Oil and the Taylor Foundation, and even had some of his most trusted employees work at these firms undercover to spy for him. Actually, though, these close employees were not real people but life model decoys, as Gideon didn’t trust anyone but himself. [New Mutants (1st series) #98, Night Thrasher: Four Control #3] Possibly, one of these life model decoys was supposed to eventually replace Gideon as CEO, for his unusual hairstyle and fancy clothes could distract the general public from his lack of aging only for so long. Gideon was recovered by his automated assistants, Eve and Adam, and his body was placed in cold stasis at an Ophrah Industries black site at Black Canyon of the Gunnerson, Colorado. There he would sleep for thousands of years until he finally awoke in the 54th century, the year 5348, barely alive after his ordeal with Selene despite his External status. In the time that passed, Earth became virtually uninhabited and uninhabitable. Gideon and Eve wandered the wastelands for five years before they encountered any form of life, a kind of radioactive predators in the sands. 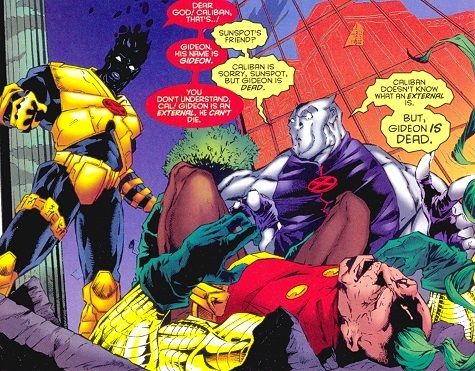 Because Selene had failed to kill all of the Externals in her massacre, the various members had slowly returned to life in the intervening years, allowing Gideon to seek out even Selene's former victims for his own crusade. 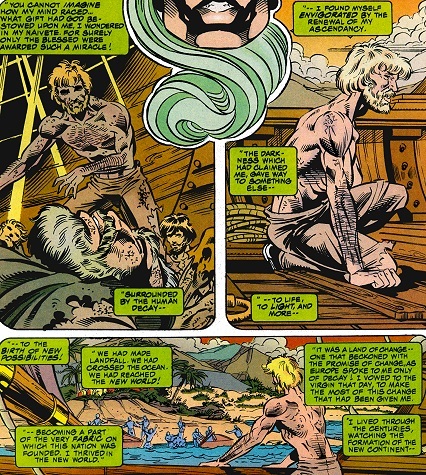 Gideon began his quest with Candra, the only member of the Externals to escape Selene's original massacre, herself having recently returned to life from an unrelated conflict. It was a long and arduous fight, but Gideon eventually succeeded in killing Candra, claiming her heart and with it her powers. Next he traveled to Mongolia and battled his way through Saul's vassals until reaching Garbha-hisen himself. Saul also fell before Gideon's growing powers, and his strength (and heart) were added to Gideon's collection. Gideon failed to avoid drawing attention to his crusade, however. The other Externals sensed the death of their brother and sister and began to gather together. Crule, Absolom, and Nicodemus ironically came to Selene for help and mutual defense. Selene worked to protect herself and the Externals this time, having apparently concluded that the Externals' power was meant to be disseminated between them, and even she could not contain all their power in one form. 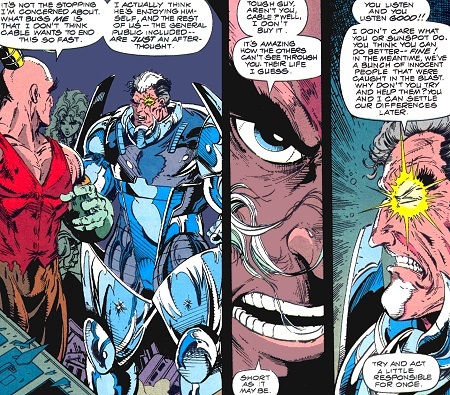 Meanwhile, Candra's death by the temporally anomalous Gideon drew the attention of Cable, time-cop. 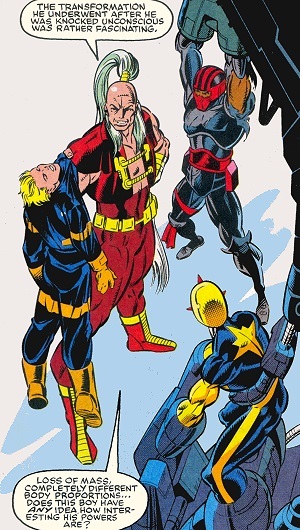 Cable gathered an ad hoc team of X-Men allies to investigate the death of the Externals, including Shatterstar, Longshot, Armor, X-23, and Doop. Gideon crossed paths with both parties during his quest, and kept one step ahead of them thanks to some unlikely assistance. Burke and Absolom had both become tired of immortality, and wanted Gideon to succeed in his mission. They were willing to be killed by Gideon, and helped him target the others so that their deaths would be permanent when the time came. 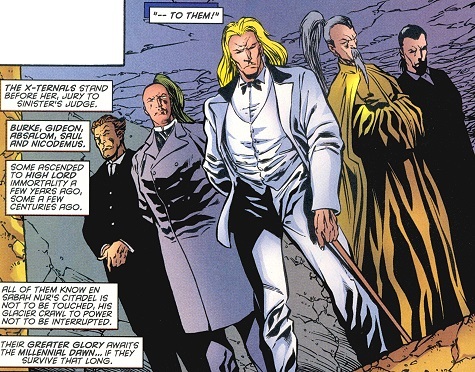 Absolom secretly reported to Gideon about the movements of Selene's group, while Burke's precognition helped him predict what Cable's group would do. 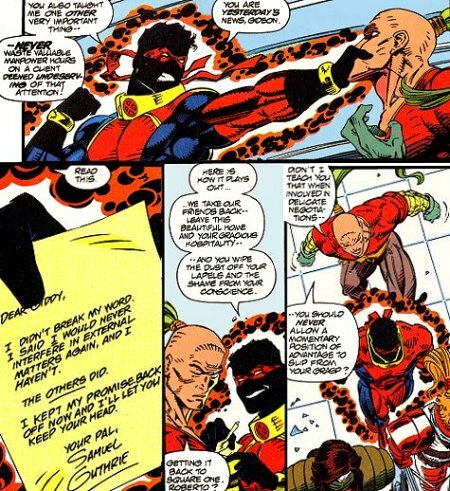 After delaying them for a time at his cabin, Burke let the X-Men go and allowed Gideon to kill him and claim his power. 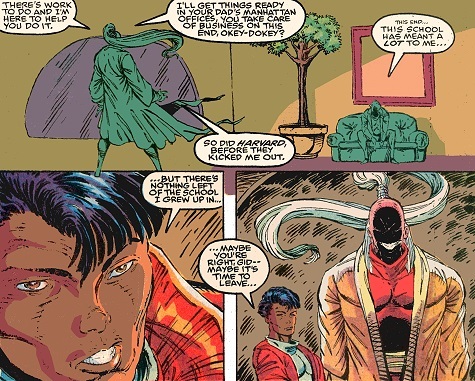 In this manner, despite the telepathic connection between the Externals, Gideon managed to keep his identity as the murderer a secret until near the endgame. Feeling he was powerful enough by this point to act openly, Gideon revealed himself and confronted Selene directly. With Absolom's assistance, he brought down and killed Crule and Nicodemus before Selene escaped with her pawn, Blink. Cable's team had located Gideon's earlier self, still in stasis at Black Canyon, but they also confirmed Gideon's identity as the temporal threat Cable was hunting. Selene and Blink joined forces with Cable in a final skirmish against Gideon. Gideon believed himself to be nearly all powerful at this point, wielding the combined powers of the deceased Externals. 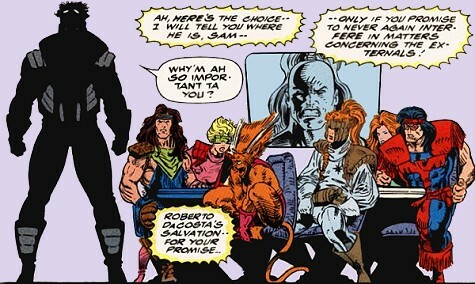 Cable and Selene managed to seed doubt in Gideon's mind, however, suggesting it was impossible for an External to ascend with the full power of the group for long without being destroyed themselves. With Gideon distracted, Blink opened one of her teleportation portals around his head, decapitating him.